“Sunset Boulevard” – few words evoke the mystique and glamour of Southern California more than the name of this historic street that wends its way west from the heart of downtown Los Angeles to the Pacific Ocean. As discussed here, the busy street passed within a few blocks of the Keystone Film Co. studios where Charlie Chaplin began his movie career in 1914. The remarkable image quality of the new Chaplin at Keystone collection from Flicker Alley, resulting from seven years of exacting restorations performed by Cineteca di Bologna and the British Film Institute in association with Lobster Films, confirms Chaplin filmed many scenes on Sunset Boulevard more than three decades before the landmark film starring Gloria Swanson and William Holden premiered in 1950. Standing Pat (1928) looking west down Sunset towards Engine Co. No. 20. The tall narrow tower (box) told me this building was likely a fire station. At top of this post, a band of Keystone Kops fall over themselves during the chase and gunfight climax of Tillie’s Punctured Romance, starring Charlie Chaplin, Marie Dressler, and Mabel Normand. I solved the Tillie location when I noticed it was the same street scene (directly above) appearing in Standing Pat, “A Ton of Fun” comedy starring the overweight trio Hilliard Karr, Frank Alexander, and ‘Kewpie’ Ross. The tall narrow tower (box, above) was a common feature used at fire stations to hang wet hoses to dry, and checking the Los Angeles Fire Department Historical Society confirmed the setting as 2144 Sunset Blvd. Engine Co. No. 20 appearing both in Tillie’s Punctured Romance and in A Film Johnnie (1914) as the trolley tracks on Sunset curve north at Mohawk Bend. The “transitive theory of film location confirmation” now starts kicking into high gear. Standing Pat confirmed the fire station at the SW corner of Sunset and Mohawk Street, which confirmed Tillie, so when I noticed the station also overlaps with a scene from Chaplin’s A Film Johnnie (above), the station confirmed that movie as well. A leads to B leads to C.
Eastward views towards Engine Co. No. 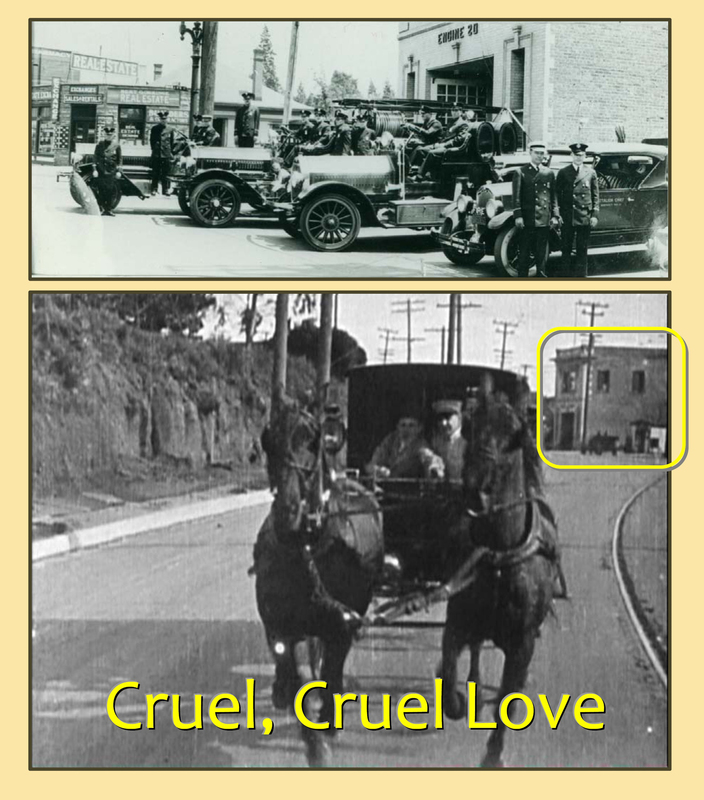 20 (LAFD Photo Album Collection – courtesy Mrs. George Walker) and in Cruel, Cruel Love (1914). The ambulance is heading west from Mohawk Bend on Sunset. 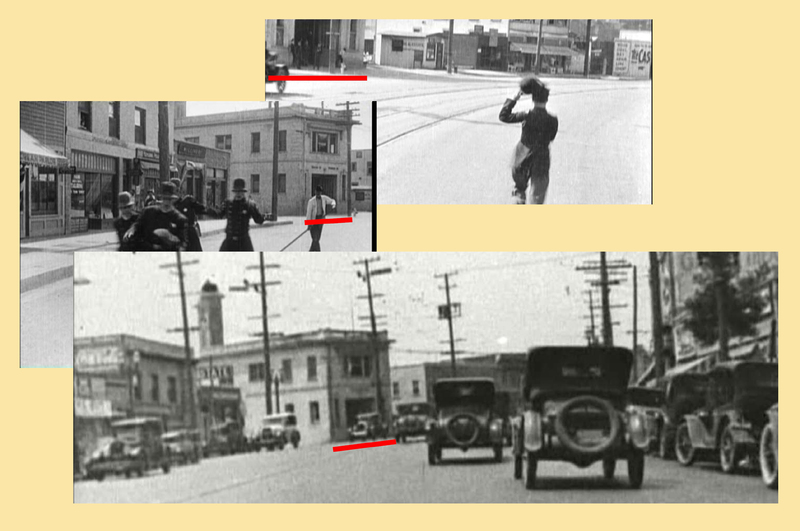 Switching perspective, now looking east towards Mohawk Bend on Sunset, the fire station at top confirms the above scene from Chaplin’s Cruel, Cruel Love was also filmed on Sunset. 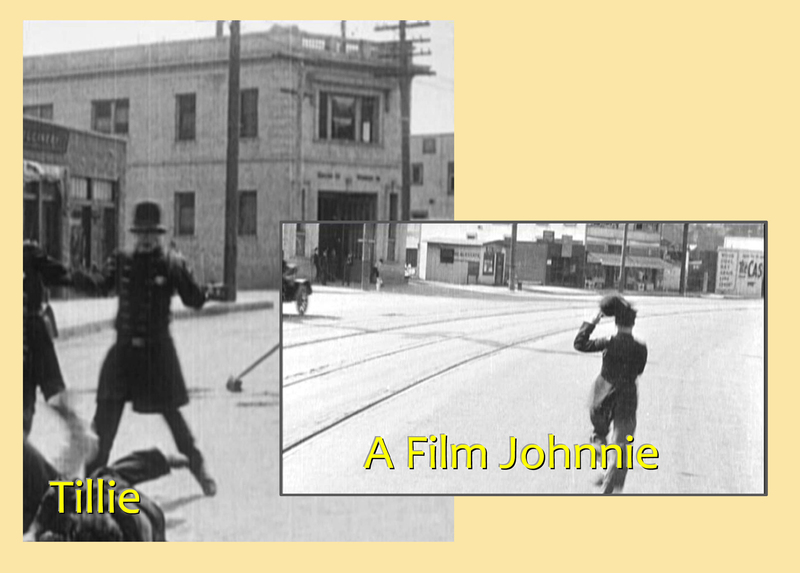 Knowing Chaplin filmed one scene for A Film Johnnie looking west beside the trolley lines on Sunset, it seemed likely the scene to the left was also filmed beside the Sunset trolley line, only this time looking east. The extant Kenmore Apartment building at back – the dotted red line marks the guard rail where Sunset crosses over Glendale Blvd. The Kenmore Apartments building (1827 Sunset – originally numbered 1817 Sunset – built in 1912) stands behind Charlie, above, confirming the view east down Sunset towards the Glendale Blvd. overpass railing (dotted red line). 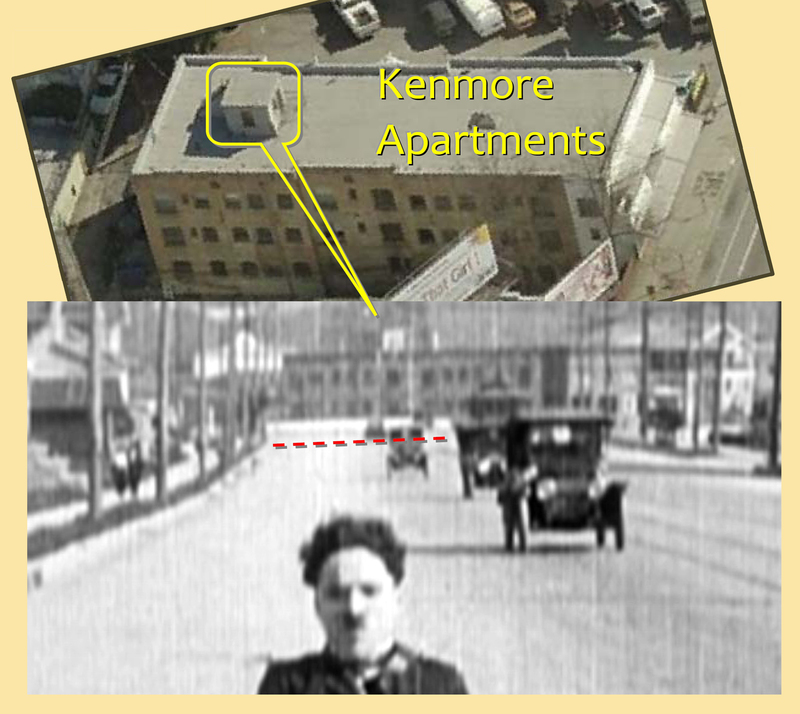 The Kenmore Apartments as it appears during a scene from Cops (1922). Originally numbered 1817 Sunset, a portion of the apartment sign reading “181* Kenmor*” appears at back. The front of the Kenmore was remodeled with streamline moderne elements in 1937 (permit issued 03-25-1937) to accommodate commercial store fronts on the ground floor. 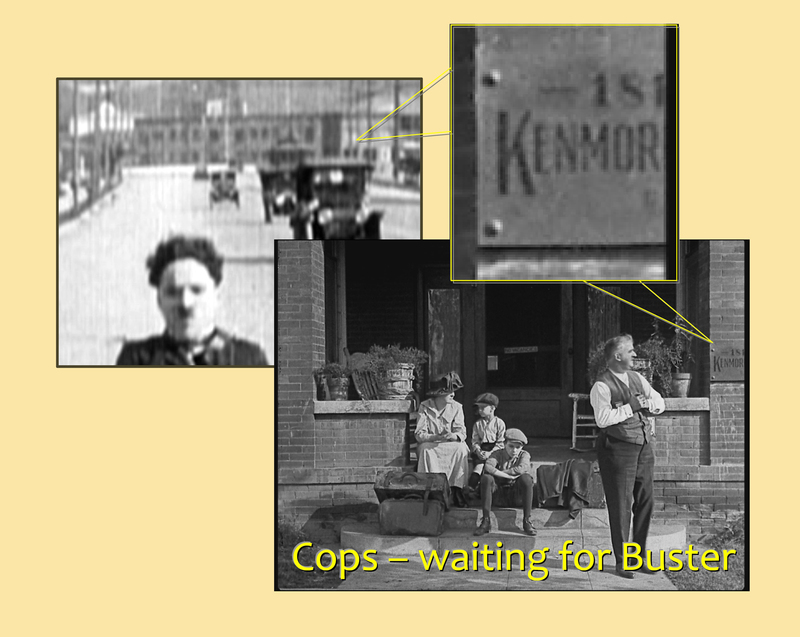 Remarkably, the Kenmore Apartments played a later role in film history, portraying the new home of the family whose wagon-load of furniture is destroyed during Buster Keaton’s classic short film Cops. 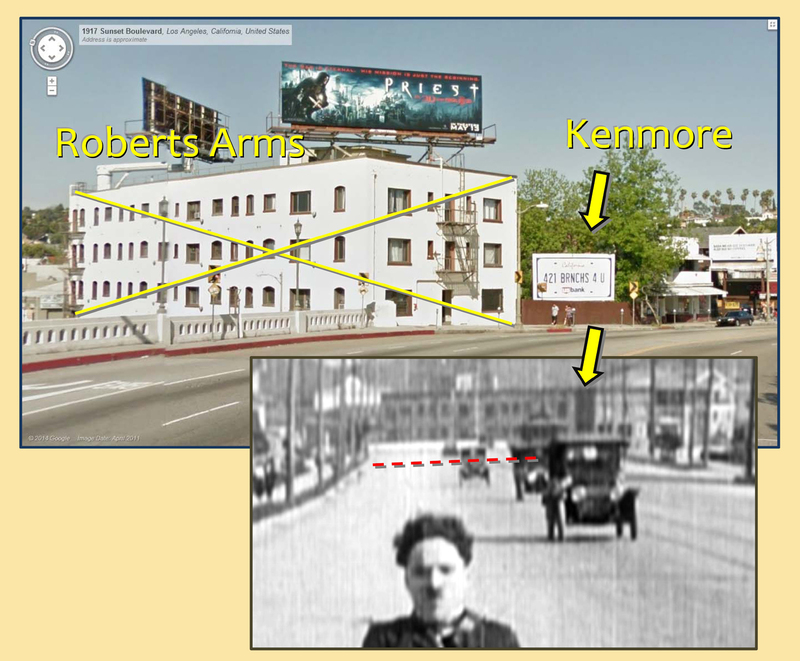 Although the Kenmore (built in 1912) is still standing, it’s no longer possible to replicate the view of the Sunset/Glendale overpass from A Film Johnnie as the more “modern” Roberts Arms (built in 1922) today blocks the view. This 1914 map shows Charlie’s path along Sunset from the Kenmore (upper right oval) towards the fire house (lower left oval). Notice the proximity to Echo Park where many Keystone comedies were filmed. Recapping – Engine Co. No. 20 at Mohawk Bend as it appears in A Film Johnnie, Tillie’s Punctured Romance, and Standing Pat. A comparable view of the larger, modern fire station on the same corner appears below. For another fun location from A Film Johnnie, you can read HERE how the beautiful (and still standing) Bryson Apartment building stood in for the Keystone Studios during the film. 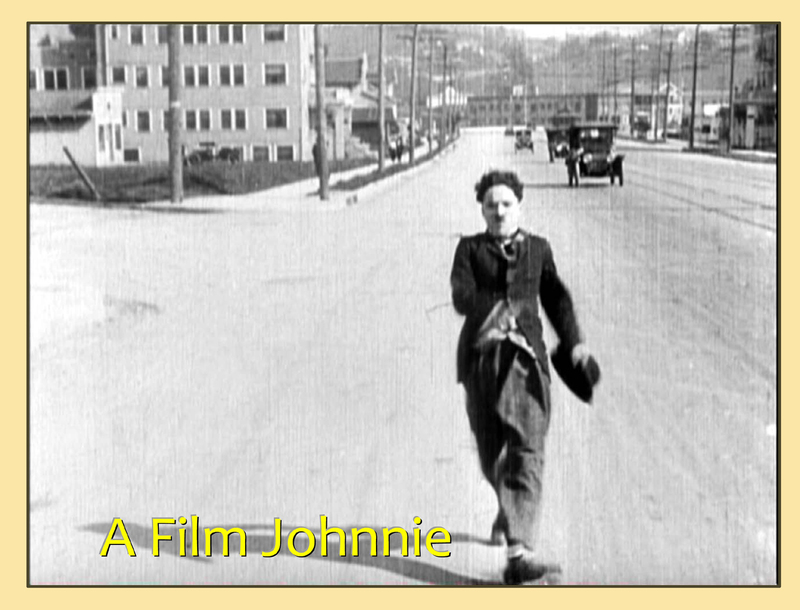 For additional Sunset history connections: (1) as explained in my book Silent Traces, Chaplin filmed his roller skate escape at the conclusion of The Rink (1916) along Sunset Blvd. near Occidental Blvd., and filmed a discarded scene from The Circus (1928) along the Sunset Strip near the former Café La Boheme at 8614 Sunset Blvd., (2) Buster Keaton filmed a scene from Cops at Sunset Blvd. and Detroit, a block from the Chaplin Studio, as shown in my post HERE; and (3) family-man Ward Cleaver’s office in the Leave it to Beaver TV show was located at 9034 Sunset Boulevard, as shown in my post HERE. Chaplin at Keystone: Copyright (C) 2010 by Lobster Films for the Chaplin Keystone Project. Cops licensed by Douris UK, Ltd. Special thanks to Robert Arkus for supplying me with a copy of Standing Pat. 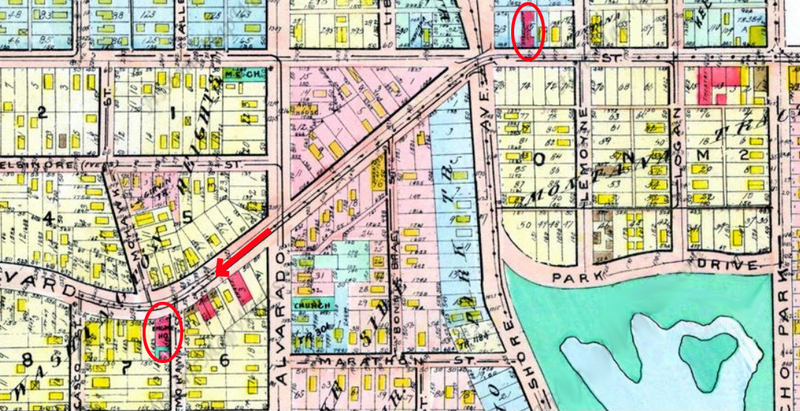 This maps shows the Keystone Studio site at 1712 Allesandro relative to Engine Co. No. 20 at Mohawk Bend, and the Kenmore Apartments near the Glendale Blvd. overpass. This entry was posted in Charlie Chaplin, Cops, Keystone Studio and tagged A Film Johnnie, Chaplin Locations, Charlie Chaplin, Cops, Cruel Cruel Love, Hollywood, Keystone Comedies, Keystone Studio, Silent Comedians, Silent Comedies, Silent Movie Locations, Silent Movies, Standing Pat, Sunset, Sunset Boulevard, then and now, Tillie's Punctured Romance. Bookmark the permalink. Wonderful — after becoming fascinated by all your explanation and the amazing range of comparative photographs – i got a real shock seeing the picture of Sunset Blvd now! Another eye-opening piece, John. I do not know how you are able to remember locations from “Tons of Fun” shorts, much less knit them into these complex geographical patters. I look forward to seeing you in Bologna and eagerly anticipate your talk. Extraordinary piece of detective work, absolutely fascinating. Of course, if you did this with today’s “LA locations,” you’d be looking in Vancouver. You are hereby bookmarked. Once again, you’re setting the standard for the archaeology of early American cinema. I’ve learned so much from you about the spaces Chaplin used to create his films. Hello, John. It’s funny, but I still have difficulty wrapping my mind around the fact that there are movies out there that are a HUNDRED years old. Time marches on… but I’m a straggler! Some even much older than that! Bamforth & Co Ltd in Holmfirth were making comedies in 1898! Fantastic. As always, I love your work. I’m a big fan of Chaplin, Glen, and have 70 to 80 books about him. One of my favorites is your “Sunnyside,” a rare work of fiction that stands besides my other non-fiction volumes. Another favorite of mine is “Carter Beats the Devil.” I even bought an extra copy to give to a magician friend of mine. I look forward to your future work. I’m only a couple of months late in reading this post. You continue to amaze, John. I’ve had your Silent Traces book since it was published, and look forward to meeting you in Bologna. Thanks for the time trip along Sunset Blvd. Mr. Bengtson. I’m sending this post to say thank you for your amazing books. For the past 2 years I would take your books out to L.A. and visit the old filming locations by myself and my camera. I would tell my friends and family what I do and they all want to come next time I go. So myself and 6 others are bringing your Silent Traces out next Tuesday to visit 6 locations from “The Kid”. As well as a farewell to the 6th street bridge they’re tearing down in 6 months. Thanks again!